If you want to give your bathroom lasting style, get the Hilton Royal Bathroom collection. It is comprised of beautiful pieces made to stand out in any space. It provides excellent storage for modern bathrooms and has a look that is sure to be noticed. Gold trimmings set it apart from other bathroom collections. Hilton Royal is comprised of wall fixtures which don’t use up valuable bathroom space. It adds contemporary lines with sophistication. The Hilton Royal Bathroom Collection by Bucalossi features a series of mirrors and consoles with gold finishing. The mirrors are large and have gold edges. 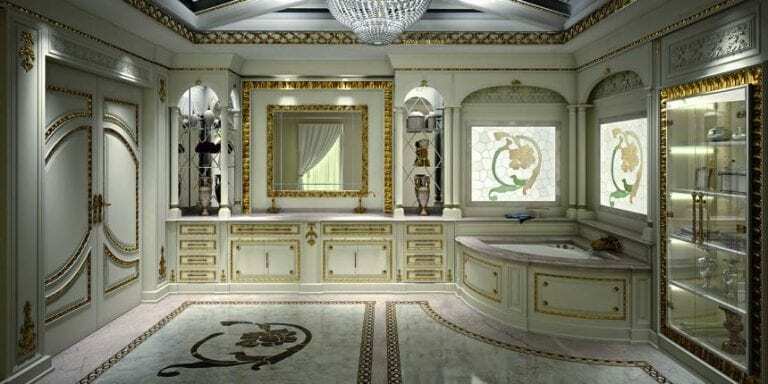 The bathroom’s floor is made of marble and also features gold elements. It has beautiful artwork which adorns some parts of the walls. Hilton Royal provides ample storage for all your bathroom essentials. It has a large glass cabinet, closed shelves, and drawers. The shelves and drawers are located under the bathroom vanity for easy access. A bathtub is placed in the corner leaving plenty of floor space. You can also opt for a rectangular bathtub without the gold finish. Who doesn’t love to unwind in the bathroom after a long day? If you are like most people, chances are that you do. Consequently, you need a functional, stylish bathroom to make you forget about your hectic day. Hilton Royal has everything you need. It is the essence of lavishness and is the stuff dreams are made of. Is the Hilton Royal Bathroom Collection a good match for your contemporary home?